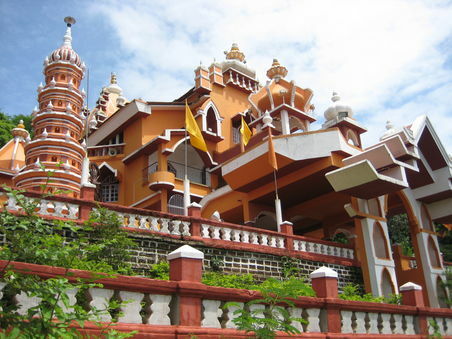 Maruti Temple is unarguably one of most beautiful temples of Panaji city. It is located atop on the famous Altinho hillock, which itself is dotted with immense lush greenery. This temple, apart from being sacred, stands out for two things. First is the panoramic view of Fontainhas and other areas that you can enjoy from top of this temple. Fontainhas area is itself one of the most beautiful areas of Panaji city and when you look it from atop it looks even more beautiful. And secondly is the stunning view of this temple itself when it is completely lit up during late evening. This temple under lights looks even more beautiful. In fact one can even visit this temple during late evening only for sheer view of this temple under lights. This temple also comes on its own during the month of February when a special 10 day fair is held in and around the vicinity of this temple. During these 10 days the temple is thronged by thousands of Lord Hanuman Bhakts or devotees. So, if you can visit this temple during these 10 days, it would be even more auspicious visit. As for the history of this temple is concerned, it is unfortunately not known very clearly as to how old and how this temple came into being? But, it is definitely one of the oldest temples of Panaji, which obviously means that it was constructed during Portuguese colonial era. Visit this temple to attain some peace of mind. Serene ambience of this temple coupled with surrounding lush greenery will surely calm your mind. And of course the amazing panoramic view of Panaji that you get to see from atop of Altinho hillock will equally calm your mind.